Quick Connect For easy, tool-free hose removal and reassembly. Clear Multiport Valve - Control and visual monitoring of water clarity during backwash/rinse operation. 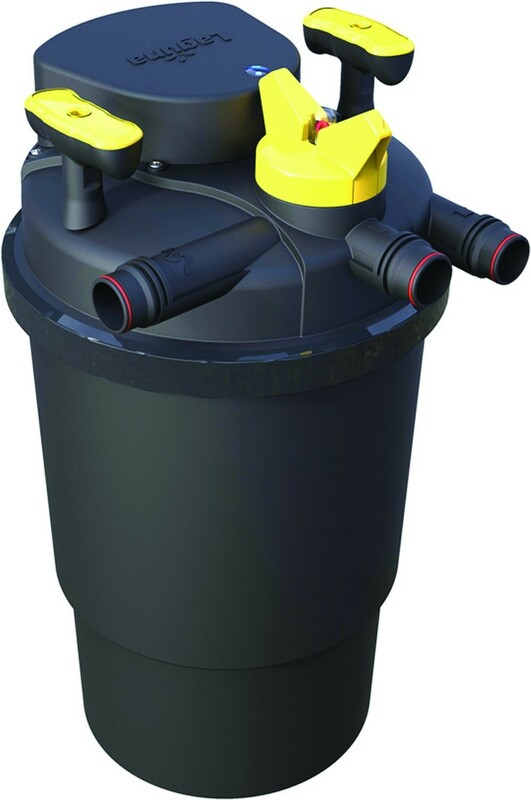 Waste Port Valve - Convenient ball valve directs waste water. UV Lamp (PUV Models only) - Internal long thin bulb assembly forces water close to UV bulb for longer contact time with UV rays. UV Lamp Ballast (PUV Models only) - Top mounted for convenient access. Bio-Matrix Media - Reusable media affords maximum surface area for beneficial bacterial growth. Agitator - Efficiently unlocks waste from media with minimum water loss during backwash/rinse. Agitator Handle- Dual-purpose handle manually turns internal agitator. Also allows safe viewing and confirmation of UV Lamp status. Pressure Gauge- Displays internal pressure to indicate when routine backwash is necessary.